The UK government should make it a goal to cut the number of low paid workers by one million by 2020, says the Living Wage Commission. Its chairman, Archbishop of York, Dr John Sentamu, has recommended that the government should pay its own workers a "living wage". The commission is an independent body bringing together business, trade unions and civil society. It says that "the majority of people in poverty in the UK are working". The commission's definition of a living wage is "an hourly rate of income calculated according to a basic cost of living in the UK and defined as the minimum amount of money needed to enjoy a basic, but socially acceptable standard of living". In 2014 the UK living wage rate stands at £7.65 an hour, and the London living wage is set at a higher rate of £8.80 per hour, to take account of the higher cost of living in the capital. By contrast, the national minimum wage currently stands at £6.31 an hour. 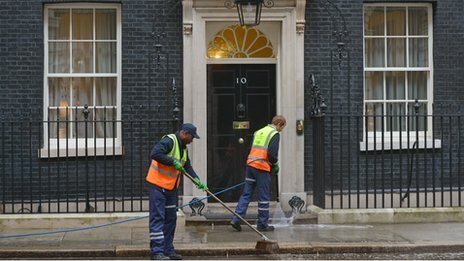 Archbishop Sentamu told the BBC that the government is the biggest employer of low-paid people, and so should look at pay levels during procurement, and that private sector companies that are capable should also pay. The commission's research shows that there are currently 712 employers across the UK accredited as paying a living wage. Service industries such as accountancy, banks and construction firms could boost the pay of 375,000 workers if they agreed to pay the national living wage. "Working and still living in poverty is a national scandal," said Archbishop Sentamu. "For the first time, the majority of people in poverty in the UK are now in working households. "If the government now commits to making this hope a reality, we can take a major step towards ending the strain on all of our consciences. Low wages equals living in poverty." BBC business editor Kamal Ahmed said that the living wage, which the commission says should be voluntary for the private sector, is distinct from the statutory national minimum wage. "The living wage is much more about what it actually costs to live," he said. "It's about 20% higher than the minimum wage." Dr Adam Marshall, director of policy and external affairs at the British Chambers of Commerce, said many firms were returning to economic growth, looking at raising pay levels "after a tough period for business". He said firms should be supported and encouraged to help pay their staff the living wage, but without "facing compulsion or regulation, which could lead to job losses and difficulties - particularly for younger people entering the labour market". He added: "Some businesses simply cannot afford to pay a living wage just yet - which is why the commission rejected a compulsory living wage. Representatives of small businesses pushed back against the recommendations of the report, saying that a higher minimum wage would add to cost pressures for small firms. Mike Cherry, policy chairman of the Federation of Small Business, told the BBC: "At least half of our members pay at or above the living wage." He said that some sectors such as retail, construction and care homes, can only afford to pay at or just above the minimum wage. One small business owner, Wayne Grills of Pizza Planet, a small pizza takeaway in Devon said: "I would say that I have a moral responsibility to make sure that they [staff] take home a sensible wage that I can afford, because if I wasn't in business, they would be either working elsewhere or without a job." Small business director Glen Miller of Antique Pine Imports in Chester said: "I think if you're able to pay, then you should. It just sends out the right message to the staff and the customers, and everybody feels more valued."